Beijing: The head of Europe’s bailout fund said on Friday he does not expect to reach a conclusive deal with Chinese leaders during a visit to Beijing but expects the surplus-rich country to continue buying bonds issued by the fund. Klaus Regling, chief executive officer (CEO) of the European Financial Stability Facility (EFSF), said the bailout deal with Greece was an exceptional case and he saw no need to repeat it for other nations. China has been a regular buyer of bonds issued by the EFSF and analysts estimate about a quarter of its reserves are held in euro-denominated assets. Regling was in Beijing just a day after euro zone leaders struck a last-minute deal to contain the bloc’s debt crisis that has undermined financial markets globally on fears that it could drag the global economy into another recession. European leaders are now under pressure to finalize the details of their plan to slash Greece’s debt burden and strengthen their efforts to revive the zone. 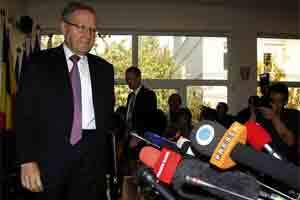 Regling was due to meet officials from China’s central bank and finance ministry on Friday. While China has surplus cash, Regling said he is in contact with sovereign funds globally. He said the EFSF was designing new investment instruments and testing models to scale up the fund. He wanted to hear how the fund could structure investments that would attract capital, he said. The €440 billion EFSF was set up last year and has already been used to provide aid to Portugal, Ireland and Greece. After the Brussels summit, governments announced a deal under which private banks and insurers would accept 50% losses on their Greek debt holdings and hard-hit European banks would be recapitalized. Regling said Tier-1 capital at large European banks would be raised temporarily to 9%. They also said the EFSF would be leveraged to give it firepower of some €1 trillion to put a safety net under bigger euro zone states, such as Spain and Italy and prevent them from being swept up by the crisis. European officials have said the leverage would be achieved either by offering insurance to buyers of euro zone debt in the primary market or via a new special purpose investment vehicle that it hopes would draw funds from China and Brazil, among other countries. Beijing has not said publicly it would invest in the fund, although it has repeatedly expressed confidence that Europe can overcome its two-year-old debt crisis. “I think the EFSF can offer a good product that is commercially interesting," Regling said, adding that China should be assured that the EFSF’s triple-A rating is solid. When asked if China was asking for any special concessions in return for its support, Regling said Beijing hadn’t done so. “When they buy our bonds, they buy the same bonds as everybody buys," he said. “There is no special deal and so it is normal conditions and we published those conditions on our website." Chinese President Hu Jintao said China hoped the measures agreed in Brussels would help stabilize the euro zone. Chinese leaders have a major interest in Europe’s fortunes because the euro bloc is China’s biggest export market. Growth in September exports to the euro zone ran at less than half the rate of August, underlining concern that the region may already be in recession. Analysts had said they expected China to maintain an investment strategy in Europe that focuses on specific countries and specific assets. That would support its attempts to diversify foreign exchange reserves and also make it easier to negotiate concessions on its investments.